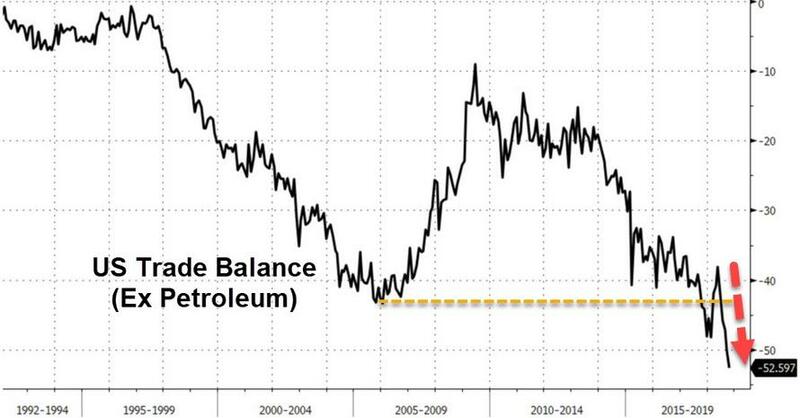 While the stock market has been suggested as the measure of Trump's success (by his own team), one look at the US goods trade balance (cough deficit cough) and you would not be wrong in questioning his administration's success (for now). The US good trade deficit was $55.5 billion in October (worse than the $55.0 billion expected and well down from the $54.6 billion revised print for September). 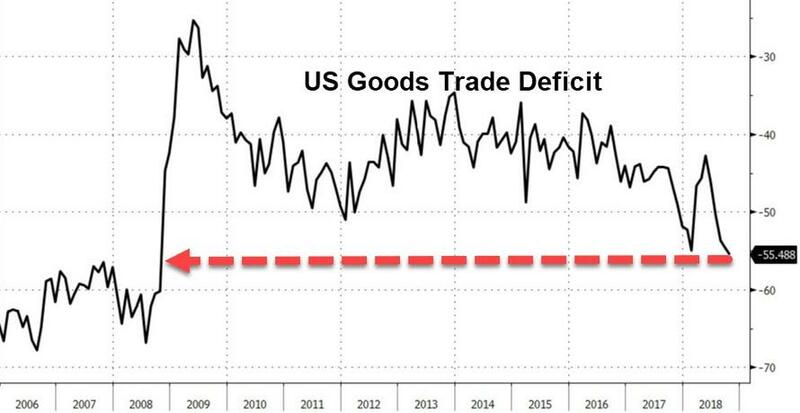 This is the biggest US deficit since October 2008, underscoring continued fallout from the trade dispute with China. The goods trade gap with China widened to a record. What's going to happen as the oil price plunge filters into this data from November? As Bloomberg notes, Net exports may again weigh on growth in the fourth quarter -- albeit less than in the prior three months -- amid a strong dollar and continued uncertainty over trade policy. Data are likely to remain volatile, reflecting a rush of activity ahead of U.S. threats to further raise levies, and a subsequent unwinding of that effect should Beijing restart some imports. Imports rose 0.2 percent to $266.5 billion from $265.9 billion, reflecting record purchases of autos and consumer goods. The overall merchandise-trade deficit was also the highest ever. Is this pre-emptive tariff buying? Or is Trump really losing this badly?